We have an ever-changing supply of quality used equipment, including push and riding mowers, snowblowers, generators, cement saws, water pumps, and more! All equipment is repaired and restored with care to ensure that it runs at peak performance. This provides our customers with an opportunity to upgrade or buy a new piece of equipment at a steep discount compared to new models. -If you have a used or broken piece, please contact us as we may be interested in buying it. We pay top dollar for older equipment. -If you are interested in purchasing used and you don't see it here, call us immediately as we may not have it on the site yet or we may be able to locate the piece you are interested in. 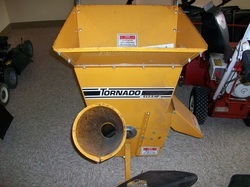 A 5HP used Baker Tornado chipper. This chipped comes with a 5HP Briggs and Stratton Engine that has been finely tuned and runs well. Perfect to create your own mulch or get rid of trimmings!